After driving halfway up California's Great Central Valley, and visiting Peterson Family Farm, we arrived at our campground. At home, I load the dishwasher (theoretically I do this as I create dirty dishes), pop in the detergent, and press "start." While camping, I walk to the water spout to fill a dishpan. Then I walk back to fill a large pot. I place the pot onto the stove to heat the water. Once it boils, I divide the cold water and the hot water so that I end up with two pans of very warm water. One gets soap, the other is for rinsing. Then, I scrub each item in the first pan, transfer it to the rinse pan, and then place it into a drying rack. When they are all done, I have to throw the water out, place the dish rack into one pan, and invert the other pan over it all, in order to keep it dust-free. Really, being at home is much easier, right? At a campground, I have no floors to sweep, mop, or vaccuum. I have no beds to make (unless you count throwing the sleeping bag back to it's proper side of the tent). I have no washing machine or dryer to run. I have no windows to wash, furniture to dust, or showers to scrub. I also have no appointments to keep, errands to run, or practices and classes to shuttle kids to and from. 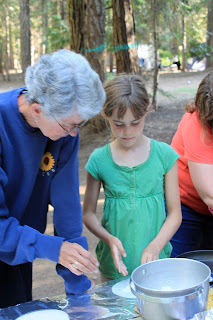 As I mentioned, eons ago, we grabbed our Abundant Harvest box on the way to the campground. Meaning that there were all sorts of yummy fruits and veggies to consume during the week. Fortunately, we also had friends and family there to share in the harvest. 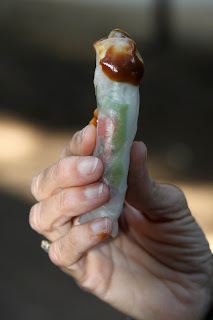 One fun use for many veggies was spring rolls. This was actually my mom's idea, and she got my kids and their friends involved right alongside the adults, in making this delicious appetizer. They are super nutritious (all sorts of raw vegetables) and easy to make (very little actual cooking). 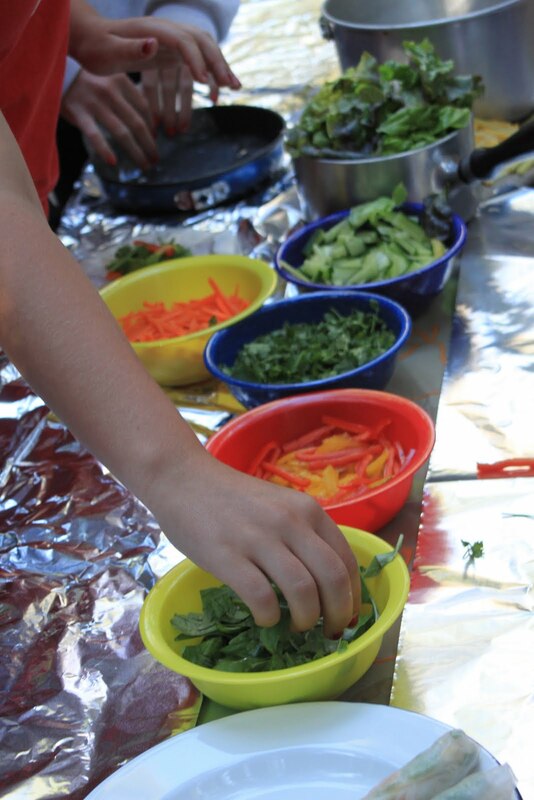 Once the chopping was done, the kids pretty much took over, and the adults got busy eating the spring rolls as quickly as the kids could build them. First, you need to buy spring roll wrappers. I have only seen them at Asian Markets. It is an extra errand to run, but as you can see, they are certainly reasonably priced! This package didn't say how many it contains, and they were being eaten faster than I can count. However, I'd be willing to bet that for $1.49, we made at least 80 spring rolls. Spring roll wrappers are made out of rice flour, water and salt. They are rolled out to be extremely thin, and then dried on bamboo mats. They are almost transparent and completely dry (almost fragile) when you take them out of the package. After dipping them into warm water for a half-minute or so, they become pliable. The other specialty ingredient is rice noodles. These can probably be found in any supermarket, but you will find them for a ridiculously low price if you get them at the Asian Market while you are picking up your spring roll wrappers. Cook the noodles according to the directions on the package. (Pretty much like cooking any pasta, but way faster). This is the only cooking you have to do. Now, chop up your veggies. They should be chopped into match sticks. I used (of course) the stuff I had on hand, but any combo is bound to be good. I had carrots, basil, bell peppers (red and yellow), summer squash, lettuce, and cilantro. You could add almost anything. Some things that come to mind are bean sprouts, cucumber, celery, mushrooms, or radishes. Once you have assembled your supplies (wrappers, cooked noodles, chopped veggies), you can begin rolling. Take a wrapper, and submerge it in warm water until it is soft enough to fold without cracking (20-30 seconds). Lay it out and begin piling ingredients onto one side of it. Remember that it is small and needs to roll up, so go easy on the filling! A couple of pieces of each veggie, and bit of noodles is all it takes. This one is filled very generously! Once you have gotten all the good stuff on there, roll it and tuck the ends in as you go. (Like a burrito). Since we had a whole group of rollers (ranging in age from 7 to... shall we say... adults? ), we ended up with a whole range of rolling styles. Some were perfectly done. Others looked a little more... creative. But all of them were delicious! Ordinarily, I would love to artfully display a platter-ful. more than four on the plate at any one time. Once they are rolled, dip them in the most delicious dipping sauce ever. Mix together hoisin sauce, peanut butter and vinegar. If it seems too thick, you can stir in a little water. Top with chopped peanuts.